I do like Google's social integration. It makes a positive difference to my search experience to be table to see which of my contacts have found what content useful. I'll admit that sometimes I find social connections that I... well, I don't remember making. This is generally because I found someone in an interesting position in an interesting company - but who I don't know personally - and decided to follow them on Twitter. That's why I like that Google tells us where we're connected to our social contacts and where they've shared the content. 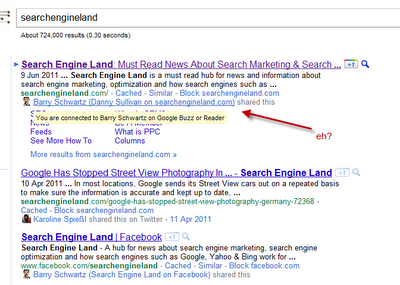 I was confused by this result for searchengineland.com. I can see that Barry Schwartz, who I'm connected too, has shared it. That makes sense. 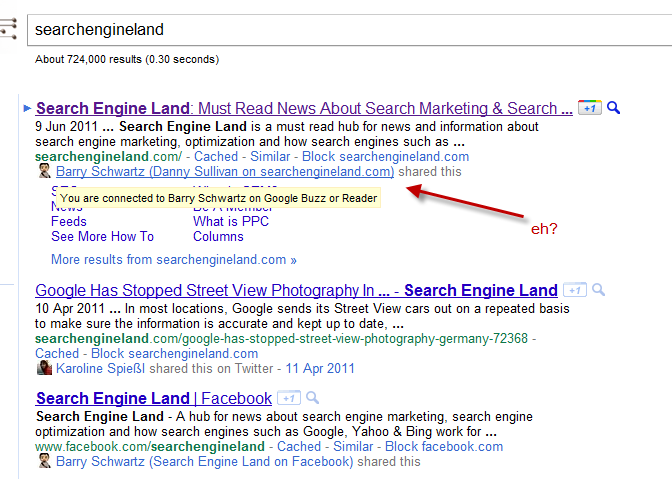 Google also seems to be saying that Barry is also known as Danny Sullivan on searchengineland.com. That makes less sense. In this screen grab I've made sure to hover over the hyperlink so you can see it's a single entity. At first I assumed this was because Barry had the full SEL RSS feed attributed to his Google profile but this does not seem to be case. So, what's going on? I just put this down to early teasing problems. It's useful that Google's attempting an "also known as" style feature for their social connections (if that's what they are doing) and I suspect they'll iron out the glitches in time.